This Duvet is very soft. It comes with corner ties and buttons down the side. The material does wrinkle so you probably won't get the look shown in the picture unless you iron it. Enhance and improve your bedroom décor with the all new Amrapur Overseas Ultra-Plush 3-Piece Solid Duvet Set. 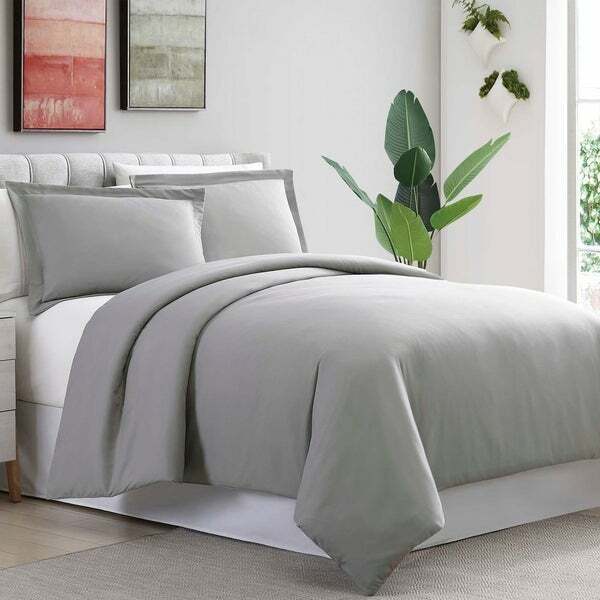 This luxury duvet cover set is stitched for durability to last a lifetime and raises the bar for comfort and elegance. A 6 inch flap with button closure ensures that the duvet cover is secure. Includes two matching pillow shams to bring elegance to any bedroom! Duvet cover is very soft and durable. The color of the duvet and pillow cases is a little darker than the picture but I still like the color. This duvet set is soft and looks nice. I wish it we're all cotton and a little smaller for a better fit on the duvet but overall happy with it. I love it, its really soft. Feels like sleeping on feathers. I would definitely purchase another comforter set like it well worth the money. Love the soft grey color and the material is very soft. Great fabric. Easy to wash and use.